If you talk to any graduated nursing student, they’ll tell you that they weren’t nearly as prepared for the coursework as they thought they were when they first started the program. There are probably a few things you don’t understand about your program, and you’ve probably been given very little practical advice. Nursing school is not easy, but it doesn’t have to be unbearable. You’ll be tired, have to make some sacrifices in your social life, and suffer a few disappointments in your grades. However, with a little foreknowledge about your schooling and your career, it’ll be a lot easier to handle. Here are some tips that will help you enjoy the nursing school experience more while successfully navigating your degree program. There are different degree programs for nurses. Certificate of Nursing Assistant (CNA): This is the lowest level of degrees. You’ll complete a program lasting between 4-12 weeks, including 75 hours of classroom instruction and clinical training. The average salary outlook for this program is $27k. Licensed Practical Nursing (LPN) or Licensed Vocational Nursing (LVN): Study programs last for about one year. You’ll work alongside doctors and nurses to perform healthcare tasks and observe patients. You can also do an LPN to associate’s bridge program or an LPN to bachelor’s bridge program, which gives you a science degree along with your nursing certification. The average salary is about $42k per year. Associate Degree in Nursing (ADN) or Bachelor of Science in Nursing (BSN): You can spend either two or four years pursuing advanced nursing certification along with basic classes for getting a degree. Both are serious commitments with great careers on the end. There’s also an RN to BSN degree program if you want more of a specialty degree. An ADN has an average salary of $53k and a BSN has an average salary outlook of $70k. Master of Science in Nursing (MSN): If you’d like to continue your education, you can get a masters in nursing. It usually takes between 18 and 24 months with highly rigorous training, but the salary outlook is much higher at around $100k per year. Doctorate Nursing Programs (DNSc): The highest degree program for nurses is a doctorate in nursing. You can do a 3-year doctorate program if you’d like to continue working as a nurse. You can also do five years in research and philosophy programs that will prepare you to teach and assist in essential research in the field. The average salary for this position is an impressive $120k. Now that you have a little more knowledge about your prospective degree programs, you can select the highest level of education that appeals to you. Most nurses pursue a bachelor’s or RN program for the great salary and short schooling term. It’s ironic that students studying to help others overcome their health challenges often don’t take time for their own health. When you’re spending every spare minute studying, it’s easy to let go of your personal health. Exercise regularly and incorporate a healthy diet. These are not easy feats for a busy nursing student, but you can do a few things like taking the stairs instead of the elevator and packing carrot sticks instead of chips in your lunches. Additionally, women and men should have a health checkup at least once per year. These yearly health screenings are essential for preventing serious illnesses and reminding you to put your health first. As you’re studying facts about breast cancer and proper nutrition for adults, take a break and call a certified healthcare practitioner. When visiting the doctor, you’ll get a checkup for your health as well as a close-up look at your future career. There’s nothing better than learning from professionals who have successfully navigated your current road. 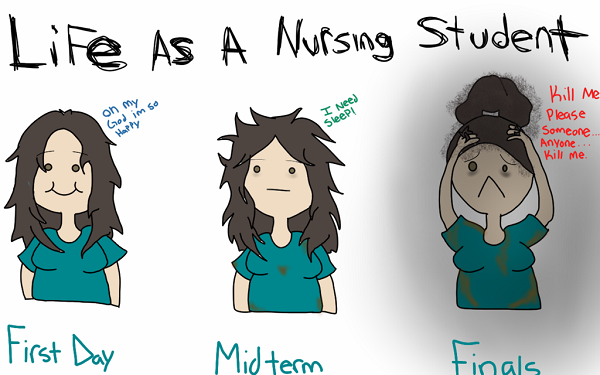 Adjust your expectations for the hectic nursing student program. Nursing school will be much easier to handle if you have accurate expectations. First and foremost, recognize that you probably won’t maintain a 4.0 GPA. The coursework is difficult, and you might get a couple of Cs or Bs before you graduate. However, don’t forget that whether you graduate with a 4.0 or a 3.0, you’ll still have your nursing degree at the end of it! Hiring professionals don’t ask for your GPA during interviews – just your degree. Critical thinking is one of the most important skills to have. During the hours of memorizing anatomy and sticking veins, don’t forget about the essential skill of critical thinking. In the realm of nursing, you’ll encounter a lot of correct answers to a patient’s questions and problems. It’s up to you to determine which answer is most correct. This skill will serve you well not only in your professional life but also when you’re taking the NCLEX. The questions on this certification test often involve critical thinking to find the correct answer. Learn to step back and look at the bigger picture. Sometimes, the most obvious answer won’t be the correct one. You’ll have to evaluate several factors and produce a solution that will maximize the effectiveness of the treatment. Practice critical thinking skills every chance you get. As you read studies written by medical marijuana lawyers for your ethics class or as you write a research paper for your psychology class, try to take a new perspective on each issue. Think outside the box in each of your assignments, and complex critical thinking skills will become second nature. You’ll get to be good friends with your fellow nursing students. It’s hard to keep up the same social life you had before, because you’ll be spending so much time at school. Those in your graduating class will be in almost every class and clinical with you, so you’re likely to get very close with them. Try to make friends in this group. It will make studying and taking tests much easier if you have friends by your side. It will also make you feel like you have a great social life, even if you’re always studying and working on clinicals when you’re together. Despite all the time you’ll be spending with your fellow nursing students, it’s important that you don’t forget the friends you once had. It’s nice to talk with students about upcoming exams, bodily functions, and horror stories of the profession, but you’ll probably get bored of that eventually. It’s necessary to have friends who talk about normal things so you can manage your work-life balance. Additionally, nursing school will end eventually, and when it does, you’ll have more time to spend with friends and family. Keep those relationships going throughout your schooling to make it easier to re-assimilate into a normal work environment when school ends. Going to school for nursing offers some great career opportunities, whether you’re going for a CNA or a doctorate. You’ll have the satisfaction of helping people, doing what you love, and making a great living. Getting to graduation presents certain challenges, but when you’re prepared, it makes things a little easier. Glean as much information as you can from graduates who have gone before, and you’ll be well on your way to a strong career in nursing.